Bunscoil Rís Edmund Rice Senior School - New Ross, County Wexford, Ireland. 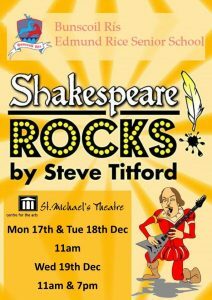 We are very excited to announce that ‘Shakespeare Rocks’ is the Musical that our Sixth Classes will be performing in, in December 2018, in St. Michael’s Theatre, here in New Ross. 8. Open Word and type in ordinary font e.g. in Times Roman, then highlight the text and go to Formation Pallett, see below, and scroll down to find the very tiny letters of NewRoss Regular. 9. That’s it! It should read in the New Ross Regular font. We had a great first day at school today. The weather is gorgeous again and we hope to get a long indian summer. It was great to see all pupils wearing their uniforms and looking so sharp. Thank you to all parents for kitting out their children so well. Reminder: No pupils are allowed on the school premises before 8.15am. Breakfast club starts at 8.15am and we encourage children to use the breakfast club each day or whenever they need to. Thank you to all for paying for book bills. Lots of parents have paid online, thank you for that. We need everybody to pay for school books this year. We will invest book money collected in new books for the pupils. We look forward to the return of pupils and staff to school after the summer holidays. School will reopen for all pupils on Thursday 30th. Breakfast club will open at 8.15am for all pupils. Remember there is no supervision of pupils before 8.15am each morning. Children are not allowed on the school premises before this time. The online payments is a great success. Sorry that the system was down for a while over the summer holidays. Lots of parents are using the system. Please continue to use this for everything, school books, swimming and any other expenses during the year. Parents can pay in whatever amounts they wish. Please ensure that your child has the correct uniform on at all times or the school tracksuit if they are doing PE or playing team games during the year.Children can wear navy blue shorts during the fine weather. All pupils can wear a school trousers this year. Information for Parents about smart phone usage in schools. Please click this link https://www.education.ie/en/Circulars-and-Forms/Active-Circulars/cl0038_2018.pdf to read a circular (0038/2018) that has been issued to all schools recently regarding consultation with teachers, students and parents on the use of smart phones. Please contact the NPC Helpline if you require any further information on the consultation process Tel: 01 887 4477. We are currently working on a new project with Trinity College that is aimed at working in partnership with parents to support their children’s learning about computer coding. Before the supports are fully developed Trinity would like some information from you as parents and your children about your current level of knowledge, familiarity and confidence with computer technology, so that they can develop materials that will make a difference. We would really appreciate it if you and your child/children would complete the surveys (links below). As these are surveys developed by Trinity College they have to follow the University’s ethical code for research so you will notice a longer than usual introduction to the survey and some consent questions. Please bear with this process as it is an essential component of university research I am afraid! If you have any questions please contact me. The closing date for the surveys is the 6th of July 2018. Thank you for your assistance with this project. Mr. Moran will host a meeting for the parents of our new school entrants on Wednesday 20th June @7pm in the P.E. Hall. 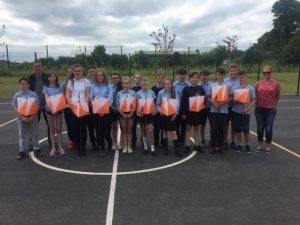 Bunscoil Rís took part in a Global Event today – World Orienteering Day. 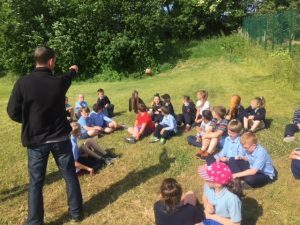 Tom Geoghegan set up an Orienteering course and all classes had an opportunity to participate. It was great fun and everyone enjoyed it. Our details are now uploaded and so far we are the only school registered in Ireland , we also have the biggest turn out in Ireland for a WOD event. 1550 Irish Participants ……… including the pupils of Bunscoil Rís. This is a fantastic achievement. Well done to all involved and thank you to Tom. 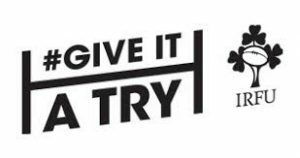 The IRFU are running programme specifically for girls over the summer months called ‘Give It A Try – Girls’ Rugby Summer Programme’. It is designed for and aimed at 10 – 14 year olds. It will be held in New Ross RFC. Girls will learn the skills of rugby in a fun environment, as well as meeting new friends and staying active. Thank you to the pupils, parents and staff that donated old phones to our mobile phone recycling initiative. We have now received a new iPad after collecting 200 old phones and we are delighted. 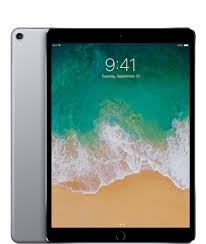 We will continue to collect for another iPad. For the month of June we are doing Active Homework instead of written homework. 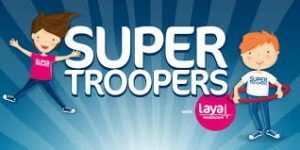 We will use the Super Troopers Activity Journal to record our activities. In September we hope to open a Codor Dojo class here in the school. First of all we need to get some adult volunteers. If you have some background in IT or coding and are willing to volunteer to help at the Codor Dojo class please drop me an email. We hope initially to run twice a month. Time and day to be decided but it will probably be some evening from 7pm-8pm. Please email gmoran@bunscoilris.ie if you have some interest & are willing to get involved. Dear Parents, We still have some unpaid book bills. Please call the office immediately to arrange payment for books. Pupils will not be allowed travel on school tours unless their book bill is cleared. We apologise for this but we need to pay very large book bills each year.